Documentary “Burma VJ” is directed by Andres Ostergaard. This documentary provides the images and video clips of the mass demonstrations held in 2007 in Burma against the military dictatorship. A small group of video journalists known as Democratic Voice of Burma (DVB) secretly filmed those demonstrations and then smuggled them to Oslo, from where those films would be sent to international news channels like CNN and BBC for screening. This group of journalists risked their lives to get the footage of protests against the military government. The protests started in early August 2007 when the government increased fuel prices. People of Burma already sick of the military government came out into the streets of Rangoon and demanded to ouster the military dictator. This was the first protest of its type after the 1988 protests against government which were led by the students and more than 3000 people were killed in it (Burma VJ, 2008). In order to keep themselves safe and hide from the intelligence police, these journalists would spread out during protests and would take footage from different sites. However, on 15 August 2007 police arrested Joshua (a reporter) with a camera during the protest. He was sent to the police station for investigation and released after taking his camera. Soon after his arrest Joshua left Burma and went to Thailand. The Buddhist monks joined the protests too and after screening the footage of protests on CNN and BCC the size of demonstrations increased day by day as people from different walks of life joined the protests. As the protests were getting more and more attention of the international media, government banned internet in order to halt the flow of information to the outer world. Situation got worst day by day and the government announced curfew and banned on mustering more than five people. Many monks were arrested and even killed by the military regime; a Japanese journalist was killed during protests. It became risky for the journalists to shoot proceedings of the protests and, at last in December 2007 Democratic Voice of Burma (DVB) was discovered by secret police. Three reporters were arrested while the rest managed to hide. This documentary provides very good insight into the idea of collective behavior during the uprising of 2007 in Burma. As the demonstrations started when the government increased the fuel prices, which was a common concern for all the Burman people and that`s why they all reacted promptly and collectively. Documentary also shows that how a small group of video journalists get success in giving coverage to the protests. Media coverage of the protests helped the protestors to get their message across and get more attention of the world community. Although, DVB had very scarce resources but still they managed to improvise all of them and got the best output. This documentary gives two important points to reckon. One is about the role of new communications technologies and other is about the role of religion in the social movements. To start with the role of new communication technologies in the social movements, now social movement activists are able to get their message across the globe much conveniently. And because of the media coverage, international community’s attention is drawn towards the conflict. This also puts pressure on the repressive governments because their repressive tactics are disclosed, hence they are threatened to be left alone in the International community. As in the case of Burma we see that at the beginning of protests people did not participate at large number but when they saw the video of protest on international news channels like CNN and BBC, only after that they decided to participate in demonstrations. They got the hope that now their voice could be heard and that’s why after screening the videos the number of protesters increased dramatically. Use of technology like filming protests has a lot to do to impact on the scope of a particular movement. Along with many other impacts globalization has greatly impacted the resource mobilization of movements, thanks to new technologies which have enabled social movements’ activists to get the attention of much more people as compare to earlier times. For instance, as shown in the documentary that the protests of 1988 in Burma in which 3,000 people were killed did not get much of the world`s attention and the main reason for that was because there was no media which could have shown the world what was happening back then. A second important point which this documentary is propagating is the role of religion in the social movements. We see in the documentary that people welcomed the participation of Monks in the protests. People were hopeful with the participation of the Monks that now their struggle to get rid of military government will be successful. 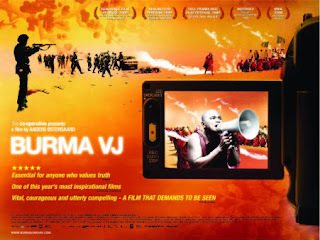 As one of the man in the documentary while watching the protest of Monks on television saying “only monks can put an end to the government… they won`t dare shoot the monks” (Burma VJ, 2008). People put their trust in the monks and the monks succeeded in gathering large number of people who took part in protests. People apprehended their religious obligation to support the monks, also; people knew that participation of the monks in protests is going to benefit their struggle. Similarly, monks also emphasized on peaceful protests as Buddhism strongly discourage the use of violence. Similarly, we can connect the participation of the monks with the political opportunity structure theory. As mentioned earlier, monks were the ones whom the government cannot oppress like common people. So; this was an advantageous for the movement to have such people whom the government could hardly oppress. The work Democratic Voice of Burma (DVB) really succeeded in its attempt to let the world know about what was happening in Burma. As Joshua says in beginning of the documentary “I feel the world is forgetting about us that`s why I decided to become a video reporter…. to the world that Burma is still here” (Burma VJ, 2008).